Atria/Emily Bestler Books, 9781501162800, 336pp. When Flossy Merrill summons her children to the beloved family beach house to celebrate their father’s eightieth birthday, both cherished memories and long-kept secrets come to light in this charming and lyrical novel from the author of The Lake Season and Mystic Summer. Flossy Merrill has managed to—somewhat begrudgingly—gather her three ungrateful grown children from their dysfunctional lives for a summer reunion at the family’s Rhode Island beach house. Clementine, her youngest child and a young mother of two small children, has caused Flossy the most worry after enduring a tragically life-altering year. But Samuel and his partner Evan are not far behind in their ability to alarm: their prospective adoption search has just taken a heart-wrenching turn. Only Paige, the eldest of the headstrong Merrill clan, is her usual self: arriving precisely on time with her well-adapted teens. Little does her family know that she, too, is facing personal struggles of her own. No matter. With her family finally congregated under one seaside roof, Flossy is determined to steer her family back on course even as she prepares to reveal the fate of the summer house that everyone has thus far taken for granted: she’s selling it. The Merrill children are both shocked and outraged and each returns to memories of their childhoods at their once beloved summer house—the house where they have not only grown up, but from which they have grown away. With each lost in their respective heartaches, Clementine, Samuel, and Paige will be forced to reconsider what really matters before they all say goodbye to a house that not only defined their summers, but, ultimately, the ways in which they define themselves. Featuring McKinnon’s “sharp and evocative” (Kirkus Reviews) voice, this warm-hearted novel is perfect for fans of Elin Hilderbrand and Mary Alice Monroe. "Completely absorbing . 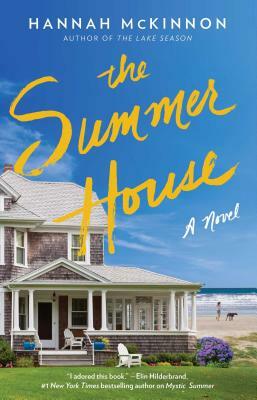 . . Sure to appeal to fans of Elin Hilderbrand and Dorothea Benton Frank, THE SUMMER HOUSE is an intriguing glimpse into a complicated yet still loving family." "A crisis, unforgettable characters, and dramatic secrets make this book resonate long after the last page is turned." "McKinnon bottles summer escapist beach reading in her latest, full of sunscreen-slathered days and bonfire nights. Fans of Elin Hilderbrand and Mary Alice Monroe will appreciate the Merrill family's loving dysfunction, with sibling rivalries and long-held grudges never far from the surface. This sweet-tart novel is as refreshing as homemade lemonade." "Beach read veteran Hannah McKinnon returns with a summer family drama that needs to be in your straw tote bag immediately." "Hannah McKinnon's new book reminds readers that the right choice isn't always the logical one. Beautifully written, Mystic Summer blends the simple allure of past summers with the messiness of the present. It's the perfect summer read—any time of the year." "This warm-hearted novel is perfect for fans of Elin Hilderbrand and Mary Alice Monroe." "The sibling rivalries, parental stresses, childhood drama, family traditions, captivating memories, hidden secrets, and life tragedies were all told in such a way that it felt like this family was familiar. I grew to love each and every character."